He may have been diagnosed with stage four bladder cancer, but Dennis Bumanglag, the former military officer who founded one of the most unique race organizing companies based in the Philippines, has chosen not to run from his duties. A case in point would be his presence during the Eggciting Fun Run held at the SM Mall of Asia; the event was put together by his company, Guerilla Race, last October and during that time, Bumanglag was battling the attendant difficulties of his illness. He was, for starters, taking frequent trips to China in order to pursue advanced treatments. Meanwhile, he was also dealing with the discomfort brought on by a catheter fitted in his body. “He was in a lot of pain,” said Veronica Ramos, the marketing manager of Guerrilla Race. And yet, there he was: caught on camera during the event, smiling and standing amongst his teammates to make sure that things are going as planned. “He really is an inspiration for us,” Ramos told Entrepreneur Philippines. And considering all that they have to deal with as far as running their business is concerned, she admitted that they do need all the motivation they can get. Guerilla Race, after all, does not organize archetypal running events. 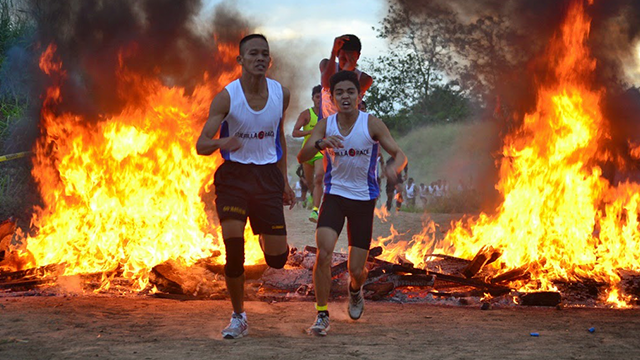 Since its launch back in 2014, it immediately chased a niche market by putting up unusual obstacle-laced races now piquing the interest of runners both here and abroad. 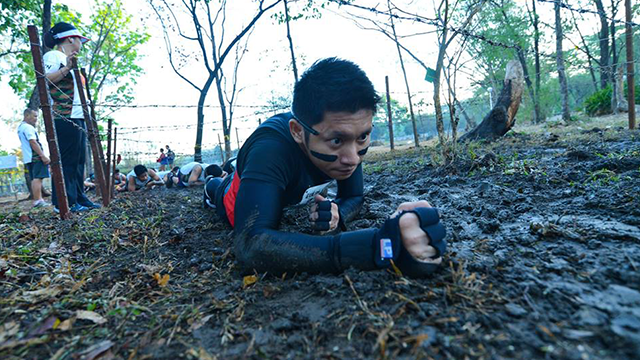 Its namesake of a flagship run, for instance, was designed by Bumanglag himself to mimic the knotty and intimidating obstacle courses commonly endured by military personnel in training; a run through one of these courses can have participants scaling over 6 foot high walls, walking on narrow beams and leaping over a wall of flame. Its other races, meanwhile, also come with twists uncommon in the industry. 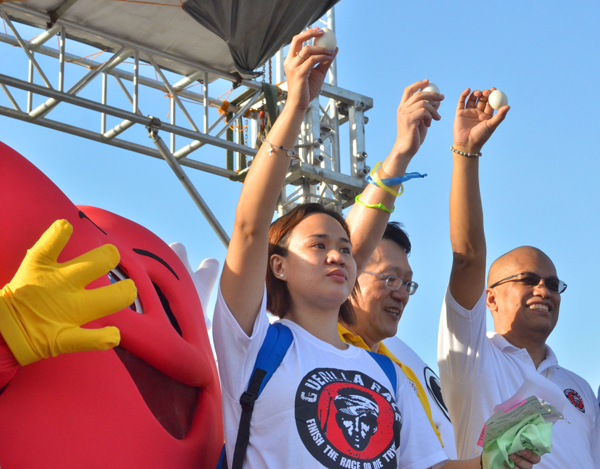 An example is the Eggciting Fun Run, which the company organized for Sarimanok and the Philippine Egg Board; done to promote World Egg Day, the event saw participants racing and getting involved with egg hunts in various stations near the bay. Taking these into consideration, Guerilla Race is a company that lives up to its name. In a country now populated with running events and race organizers armed with big names and sizeable resources, it throws itself into battle as a fighter of unconventional means. And the results afforded by such tactics thus far have been double edged. 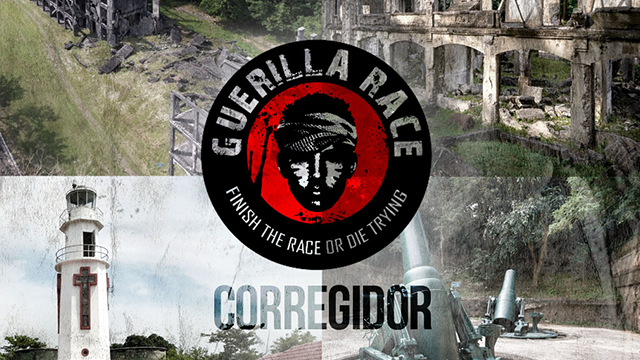 On one hand, Guerilla Race’s unique running events have been lauded by seasoned athletes who have already had their fill of conventional running events. On the other, each of its races can be logistic nightmares. “Our obstacles are prefabricated,” Ramos said. And the locations chosen to host them—from the Timberland Heights in Rizal to Corregidor (locations chosen for both terrain and scenery)—are far from being a stone’s throw away from their main office in Paranaque. Putting up one race alone, Ramos said, can take between 3 to 6 months. It can also cost up to Php 3 million. But according to her, all the effort and resources invested in these races do pay off. “We are doing well now,” she said. And “well” according to her can be measured on different fronts. For starters, Guerilla Race has started gaining ground since its opening salvo back in 2014. From a regular turnout of 200 people, the headcount at a standard Guerilla Race now can reach up to 700. 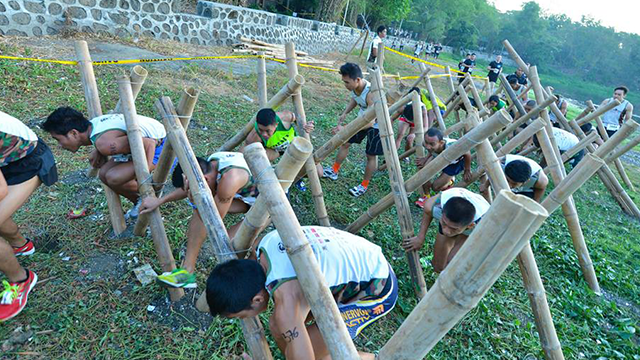 The numbers are but a fraction compared to the tens of thousands that would attend the likes of the highly popular National Milo Marathon, but it should be of note that Guerilla Race will only be doing its seventh standard race come February 26, 2017 at Altaraza, San Jose, Bulacan; that will be the company’s 10th event overall; meanwhile, the Milo run has just had its 40th edition this year. 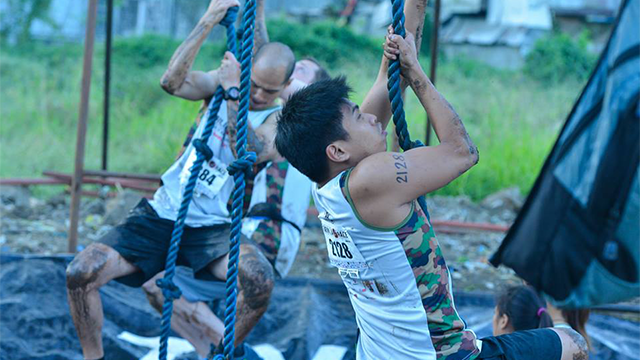 Meanwhile, the types of people now joining Guerilla Race’s events have also expanded. During its first race, majority of its participants were from the military itself—people who were at home with the challenging obstacles the company’s runs are bedecked with. These days, Ramos said that it’s “70/30, favoring civilians.” And “civilians” is but an umbrella term that covers gym buffs in their twenties and thirties, celebrities both here and abroad (these have included ABS-CBN’s Gerald Anderson and History Asia’s Jaime Dempsey,) and even the casuals—people drawn by the sheer novelty of the company’s races. “That’s where we can really profit,” she said. And should they manage to advance their company’s earnings through this expansion, Ramos added that this would be good news not just for Guerilla Race itself. Since its inception, after all, the company has always been focused on pursuing various advocacies. Its flagship race, for one, was conceptualized because Bumanglag wanted a platform that would help people acquire army-level discipline. Meanwhile, as a company pretty much built on the back of the local military, Ramos said that it is only fitting for them to give back to the former and they do so through financial support. Ever since its first race, the company has made it a point to donate a percentage of its earnings per event to the AFP Educational Benefits System Office, which in turn provides educational benefits to military personnel and their dependants. “The army has done so much for the country,” Ramos said. “It’s only right that we give something to them in return.” And to make this happen, she added, there is very little the team isn’t willing to do. Such a “yes sir!” mentality can be quite a challenge, she admitted. Coming from a non-military background herself, Ramos said that she once found it difficult to adjust to the company’s demanding work culture. Meanwhile, the events of Guerilla Race—with their arduous specifications—have also seemed like battles difficult for the company to win. But doubts of success she said can be counteracted by morale and that is something that the company is rich with. Very few, after all, can lift the spirit like the sight of one’s leader fighting side by side with his or her troops, regardless of that leader’s personal hardships. And this, according to Ramos, is a sight common to the team of Guerilla Race.